After premiering for 1 day in Indonesia (which was still 1 week earlier than the US premiere date), my wife and I saw this movie last night. Just like during the premiere week of The Fate of the Furious, most theaters were showing this movie. We saw it in Lotte Avenue where it was playing in 4 out of 6 theaters. It was amazing how the Indonesian cinema chains pampered us with this kind of arrangement. I guess there were more and more people coming to see movies nowadays. Anyway, let us get on with the movie. 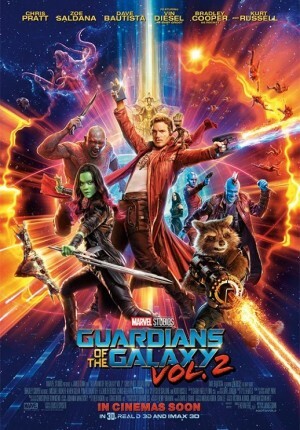 Movie started with the Guardians led by Peter Quill (Chris Pratt - Jurassic World, Passengers etc) and his partners Gamora (Zoe Saldana - Avatar, Star Trek trilogy etc), Rocket (Voiced by Bradley Cooper - American Sniper, The Hangover trilogy etc), Drax (Dave Bautista - Riddick, Spectre etc) and last but not least baby Groot (voiced by Vin Diesel) were tasked to protect some important batteries for the Sovereign people. After completing the task, the Sovereign's leader Ayesha (Elizabeth Debicki - The Great Gatsby, Everest etc) was quite happy and released Nebula (Karen Gillan - The Big Short, Doctor Who TV series etc) to their hands. In case you do not remember, Nebula was the half sister of Gamora who was one of the villain in Volume 1 and was always competitive with Gamora. When the Guardians left the planet, they were chased by Sovereign swarm of armies due to some reason and only briefly managed to get away. They landed on the nearest planet and met with none other than Ego (Kurt Russel - Tombstone, Big Trouble in Little China and many more) who claimed to be Peter's father. Though skeptical, Peter, Gamora and Drax agreed to go with Ego to his home planet. Ego was also accompanied by his friend Mantis (Pom Klementieff) who was like an empath and able to feel the emotions of other people. Meanwhile, Rocket and Baby Groot who were guarding Nebula while repairing their ship was followed by Yondu (Michael Rooker - Jumper, The Walking Dead TV series etc) and his team. They were trying to capture them due to the large bounty issued on the Guardians. This is where the story became more complicated as there was a very bad character of Taserface (Chris Sullivan) in Yondu's team who would later create havoc. Later on, Peter and the rest who reached Ego planet was shared with a shocking knowledge of who Peter truly was. Peter seemed happy with this information though Gamora was a lot more cautious. Peter also felt that he belonged to Ego planet and wanted to learn more from his father. So what would happen to Rocket, Baby Groot and Nebula with the chase from Yondu and Taserface? What was also going to happen with Peter and his relationship with his father? Would the Guardians able to fight the greatest threat they would face and save the galaxy one more time? Find them all in this fun, light Marvel superhero movie. This movie was a very fun superhero film. It did not provide us with very heavy storyline, the premise was quite simple and best of it all, it was having lots and lots of funny moments. My wife and I truly enjoyed this movie as we had laughs all over the movie and there were even some emotional moments as well which was very lovely to see at the end (and made my wife very emotional). I love the chemistry among the Guardians, and I loved Baby Groot's very cute and adorable behavior. I also loved the opening scene which I think was very cool. In addition to the good chemistry among the stars, I also felt that Mantis' character was fun to see, especially whenever she was interacting with Drax. In this sequel, it was also surprising to see Drax' very funny characterization and his comments. Both Yondu and Nebula also had larger important role in this movie compared to Volume 1. There was even a surprise new character played by Sylvester Stallone whom I understand would be having larger role in future Marvel movies. Apart from those fun interactions and the nice light story, the movie itself was not the type of full of action scenes. Mostly it was done in the early stage, middle part and the ending part. The sound effects were good, the effects involving Baby Groot and Rocket were awesome, but I felt the CGI effects were not that nice, especially during the scenes in the Ego planet where it really looked computerized. However, it was not really a bothering scene. One thing that was quite curious for me is the trailer to this movie was already showing Kurt Russel portraying Peter's father, which I thought would be best kept hidden to avoid spoiler. But then as we continued watching it, I realized that it was more like a part that was supposed to intrigue us. I personally felt that this movie was better than Volume 1, in term of the story and characterizations. And for those of you who knew that Marvel's movies would have some end credit scenes, better wait till the very end, since this film had got not 1, not 2 not even 3, but 5 post credit scenes altogether. So if you enjoyed the first volume, you would enjoy this one even better. I would recommend you to watch the first one before seeing this one to have a better understanding on the movie. Though I am pretty sure that most likely you would have seen it. Now if you are a fan of a much heavier superhero movie, than this one may not suit your thirst, but I am confident that you would still be entertained watching this one.